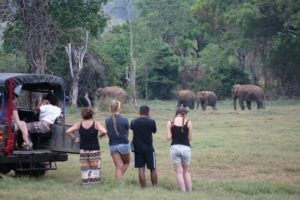 Volunteer at our Conserving Asian Elephants programme, run by the SLWCS (Sri Lanka Wildlife Conservation Society), one of the first organizations in the world to develop an integrated approach to Human Elephant Conflict (HEC) resolution, poverty alleviation and elephant conservation in Sri Lanka. While still continuing to address HEC issues, the programme has evolved into a multi-pronged project consisting of ecological research, capacity building, community development and sustainable development components. 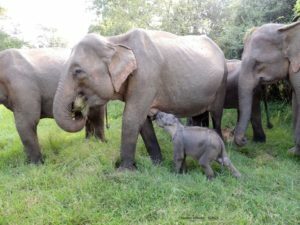 To conserve and protect the Sri Lankan elephant (Elephas maximus maximus) and its habitat (especially outside the protected areas). 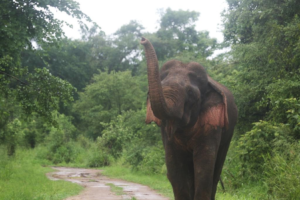 To develop solutions to resolve HEC through a better understanding of elephant ecology, biology, human needs and elephant management technology. To integrate community participation into project planning, implementation and management. To develop local capacity to erect, operate and maintain solar powered electric fences over the long term. To establish a sustainable community integrated HEC management program. To create support for sustainable wildlife conservation and protection through community development, capacity building and sustainable development. To develop economic incentives to support the long-term conservation of the Sri Lankan elephant and its habitat. As a conservation volunteer in Sri Lanka you will help and assist with the ongoing projects. As your time on the project is only relatively short in relation to length and ongoing nature of the research and community development projects you are not guaranteed to get involved in all the areas detailed. Trail transects on trails that range from 5-10 kilometres on undulating to steep terrain. Road transects outside and inside the park. 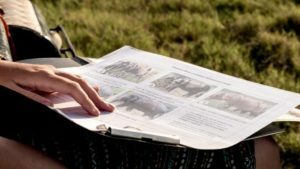 Elephant ID-Identification of elephants in the project area. Department of Wildlife Conservation fences. Observations of elephants from tree hut and at tanks. HEC and HLC assessment surveys. Project Orange Elephant –Citrus Plantation monitoring and evaluation. Data on farming operations (such as number of eggs produced, milk production, health issues, paddy/fruit and other crop production). Working on the operational chores of the farm such as tagging animals, cleaning, feeding, taking care of chicks, etc. Cleaning and maintenance of vehicles, bicycles and other equipment –this will be done by all staff and volunteers on a pre-arranged schedule. Clearing/Cleaning of field bases and equipment. Packing/Storing and Stock taking of all equipment before departure of groups of volunteers/at least every two months. The total research area lies within the confines of the Central and North Central Province forests of Sri Lanka and the base camp is situated in the Pussellayaya village on a scenic hill overlooking a large tank (reservoir). The climate ranges from a low of 14C in the wet zone mountains to a high of 34C in the dry zone jungles, where the average temperature will be in the region of 25C-32C. Expect hot and dry weather for the expedition with the occasional shower and humid day. Insects could be a problem in the night when they are attracted to the camp lights. The monsoon season (Dec-Feb) will be very wet with thundershowers throughout the day/night. Please be prepared for basic living conditions. Wasgamuwa – the expedition base is a research station that consists of a central house with a kitchen, a small library, a dining area and a veranda. Team members will stay in rooms within the central house and also in cabanas made from local material dotted around the central house. Each cabana can accommodate two people comfortably and will share showers and toilets. Participants will pair up to share rooms, although sometimes it may be possible to cater for team members wishing to stay in single accommodation. You will be at least 4 hours from the closest internet cafe, and may have irregular mobile phone coverage in parts of the core study area. There are some modern amenities such as showers, porcelain toilets and a finite amount of solar-generated electricity. All meals will be prepared for the team and vegetarians can be catered for. Clothes can be washed at base. Beds with mosquito netting will be provided. Please be prepared for basic living conditions. Wasgamuwa – the expedition base is a research station that consists of a central house with a kitchen, a small library, a dining area and a veranda. Team members will stay in rooms within the central house and also in cabanas made from local material dotted around the central house. Each cabana can accommodate two people comfortably and will share showers and toilets. Participants will pair up to share rooms, although sometimes it may be possible to cater for team members wishing to stay in single accommodation. There are some modern amenities such as showers, porcelain toilets and a finite amount of solar-generated electricity. Clothes can be washed at base. Beds with mosquito netting will be provided. All meals will be prepared for the team and vegetarians can be catered for. All volunteers have to arrive one day early and check into a hotel in Colombo for their first night. We also do not recommend volunteers arriving on long distance flights to travel on the day they arrive to the project site since it is a 7 to 9 hour trip. The first night hotel cost is not covered by the volunteer program fees. We provide a list of recommend hotels. Volunteers will be met at the hotel early the following morning by one of our associates who will transfer them to the Fort Railway Station and make sure that they are safely aboard the right train to Kandy. The train and bus fares, meals and refreshments provided during the trip are covered by the program. Volunteers will travel on the 7 am Colombo Kandy Intercity Express and will arrive in the cultural capital city of Kandy around 10 am. They will have about an hour for breakfast and to visit around and take in some of the sights of Kandy before catching the connecting bus to the project site.In Kandy they will be met by one of our staff and will have breakfast and then accompanied by the SLWCS staff person they’ll board the bus to go to the project site. Please note that if volunteers are staying in a hotel outside Colombo then they have to make their own arrangements to get to the Fort Railway Station in Colombo by a 6 am on their program start day. Volunteers have the option of ordering a private vehicle transfer from the airport or hotel to the field site but this will cost additional. You will have access to long-distance communications whilst on the program, so you can keep in touch with family and friends. There is mobile phone coverage (cell phone with local service), Internet and WiFi at the project house. There are additional charges for using these facilities. Participants typically use calling cards or you can get a local prepaid SIM for your phone to keep in touch. You will be at least 4 hours from the closest internet cafe, and may have irregular mobile phone coverage in parts of the core study area. The climate ranges from a low of 14C in the wet zone mountains to a high of 34C in the dry zone jungles, where the average temperature will be in the region of 25C-32C. 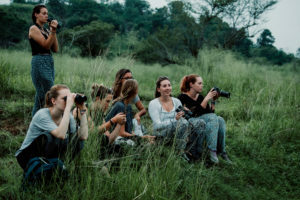 Volunteers will get an opportunity to observe the incredible habitat diversity of Sri Lanka as well see some of the traditional lifestyles during their stay at Wasgamuwa. Wasgamuwa is situated in the Central Province and overlaps with the Cultural Triangle of Sri Lanka where six of the seven UNSECO designated World Heritage Sites are (please see attached map below). The City of Kandy with the Temple of the Tooth is just one and a half hours from Wasgamuwa while the ancient city of Polonnaruwa, Sigirya (acclaimed as the 8th Wonder of the World), and the Golden Temple of Dambulla are all 3 hours away by vehicle. Trips can be arranged to any one of these sites as a break from fieldwork. A visit to any one of these sites will also help the volunteers to understand how Buddhism is central to the culture and traditions of the villagers they are working amongst, and how Buddhism has also helped to create a tolerance for wildlife in these people. Additionally, Sri Lanka’s longest river the Mahaweli Ganga is about 20 minutes away by vehicle from the project house. Other local sights such as Nuwera Eliya, Kalkudah Beach and Batticaloa are all about 3 -4 hours away by vehicle. 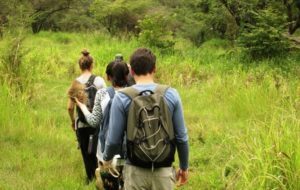 To cool off, volunteers could also go to the Knuckles Mountain Range, which rises up to nearly 7,000 feet, and is about 1 hour away from Wasgamuwa. In the Knuckles Range there are beautiful areas to hike and plenty of cool streams and waterfalls to bathe in and the opportunity to see several endemic species of birds of Sri Lanka. The temperature drops off to a comfortable 20-28 degrees at this altitude. As a conservation volunteer in Sri Lanka you will help and assist with the ongoing projects. As your time on the project is only relatively short in relation to length and ongoing nature of the research and community development projects you are not guaranteed to get involved in all the areas detailed. Unless otherwise mentioned each activity will take 3-4 hours. Some activities are conducted together and all details will be discussed in the field. All activities include data entry during the afternoons or when in the field bases due to unavoidable circumstances such as heavy rain or vehicle breakdowns, etc. Most activities are conducted under the leadership of trained field assistants who report to the researcher or project manager in charge. When we stay at the campsite there is sometimes a 1 hour travel time to and from there to the field house or longer to other research sites. Not all the activities will be conducted throughout the year.